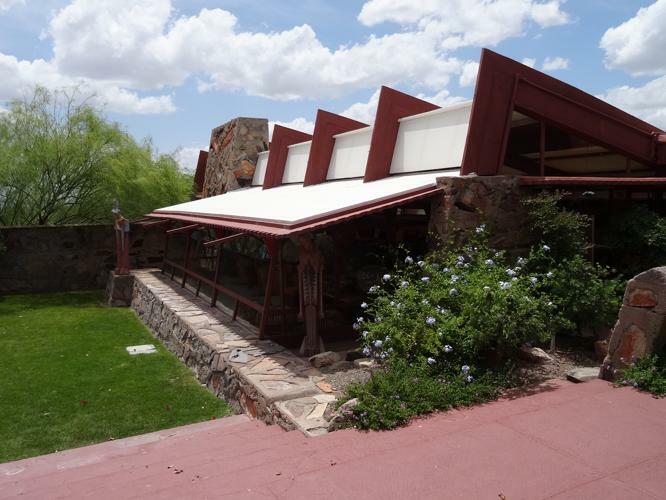 At the age of 72, Frank Lloyd Wright decided to build his winter home in Arizona: he called it Taliesin West. Wright loved the Arizona desert. He found the rocky landscape inspiring when he visited it in the 1920s, and when, after he had been ill with pneumonia, his doctor suggested a winter relocation to a hotter environment, the architect jumped at the chance to build a new winter base there. 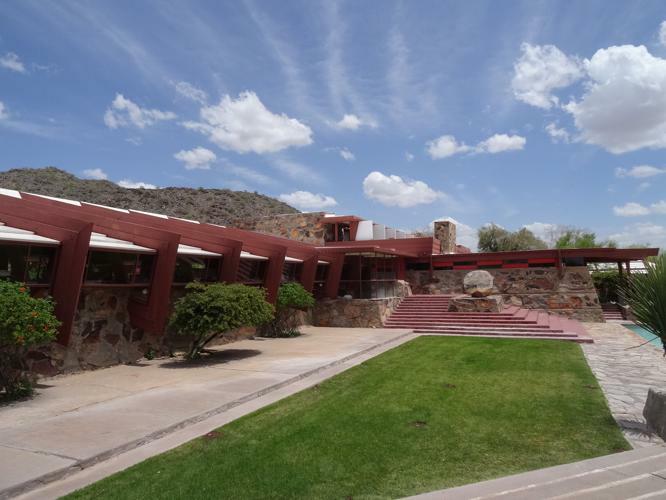 The construction of Taliesin West started in 1937 and was temporarily put on hold in 1941, just before the beginning of World War II. After the war, Wright and a crew of young architecture students went back with a brand new design to finish the project. 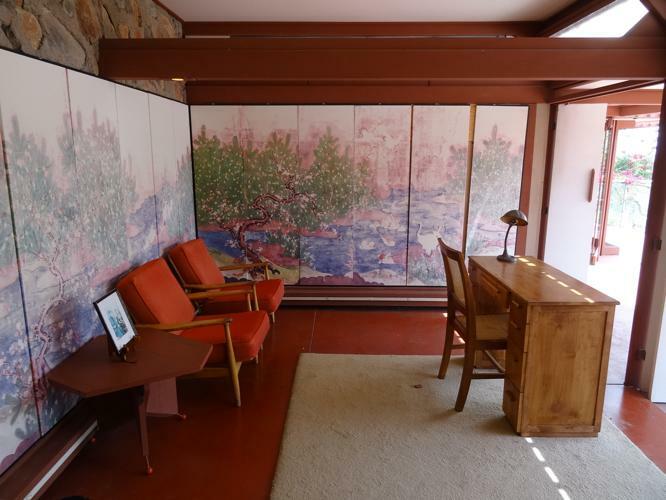 Taliesin West had to provide a drafting room and rooms for the apprentices and staff, as well as a house for Wright and his wife. In addition, there were workshops. 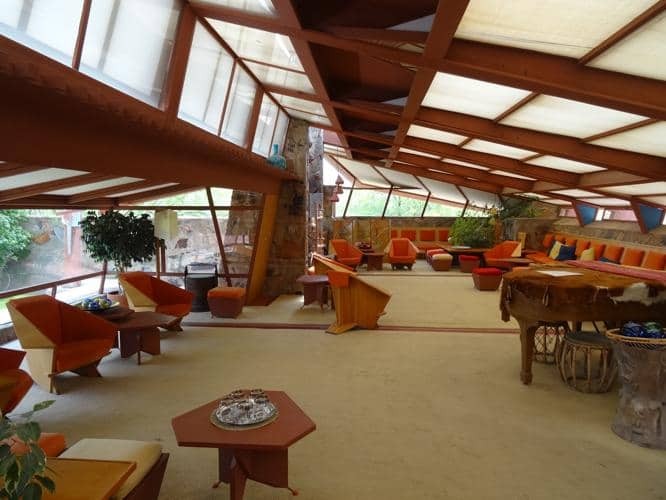 Taliesin West was actually built by Wright and the apprentices, and altered, extended and adapted by them over the years. 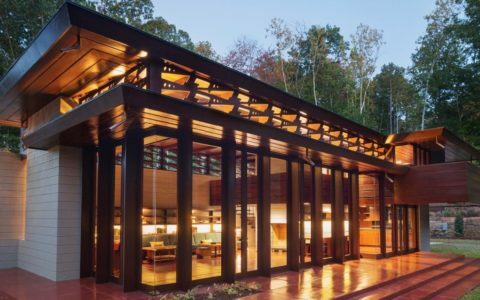 What can be called a pillar of Frank Lloyd Wright’s architecture, is the role that nature played in his projects. 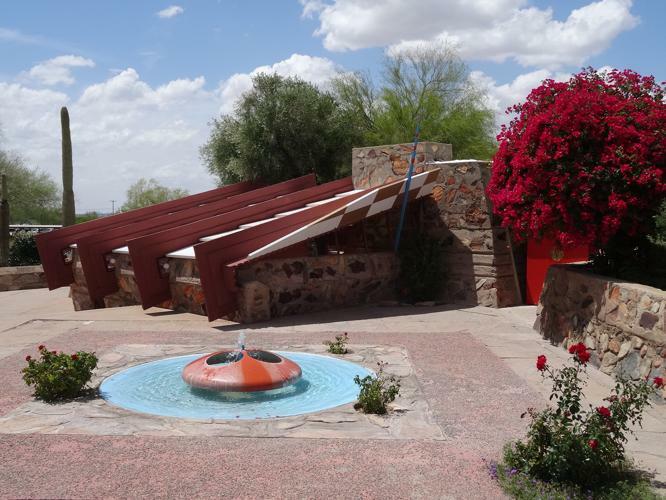 Taliesin West is one of the most beautiful examples of this approach. 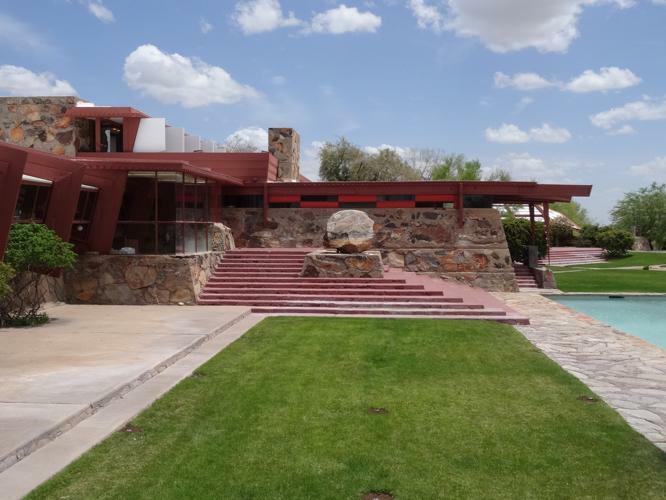 Wright wanted to make the building coherent to its environment. This meant creating what he referred to as ‘broken lines’- a jagged outline, because the desert has no straight lines. 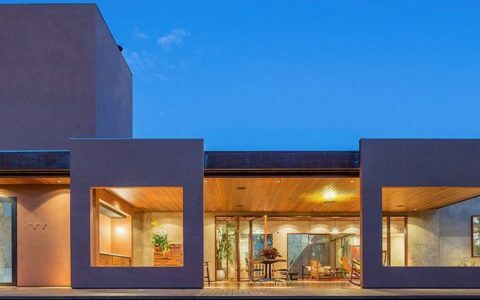 The architect also wanted to use desert materials, but use them in a totally new way. The builders gathered local stones from the site, placed them in wooden forms, and then poured concrete into the forms to make a solid mass of what became known as ‘desert masonry’. When the wooden forms were removed, the builders removed the thin layer of concrete on the outside to reveal the stones within, sometimes washing the surfaces of the stones with acid to reveal their colors even more strongly. 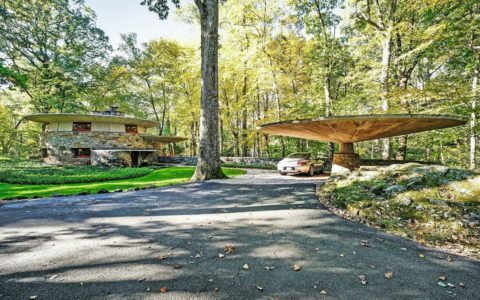 To constantly be in touch with the surrounding nature, Frank Lloyd Wright added a series of timber frameworks with linen canvas stretched over them. This made the building looking like a tent, with the fabric letting through lots of light but not glare, and with numerous flaps, blinds and cords, so that entire areas of what would normally be wall could be folded away to open the interior to the outside. 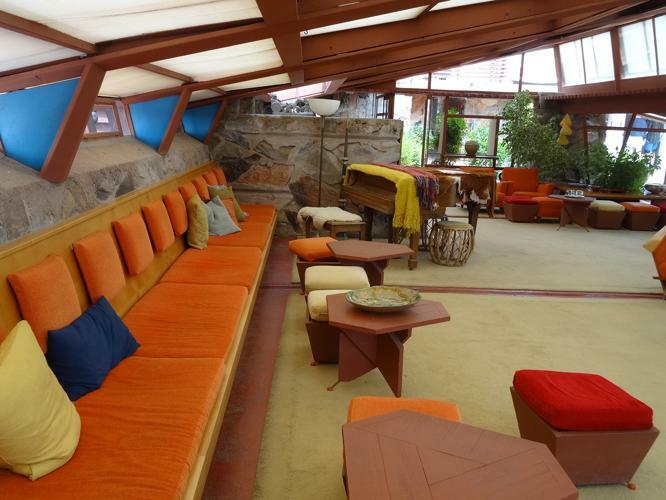 The most important area at Taliesin West was probably the drafting room. It was in these halls that many iconic structures came to life and continued to be brought forth by new generation of architects. 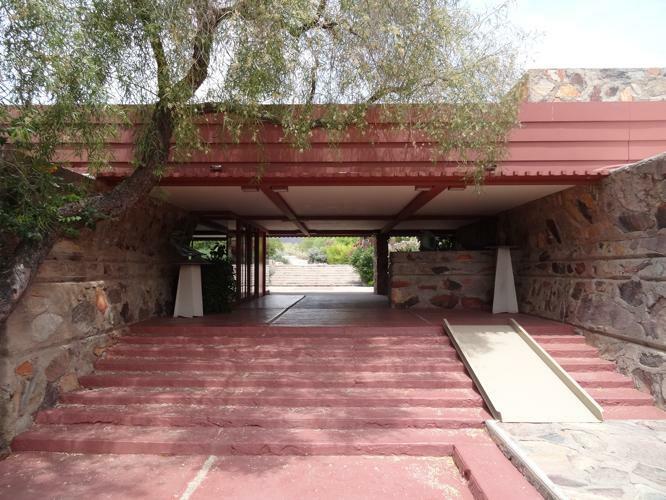 Today Taliesin West is home of the Frank Lloyd Wright Foundation and open to the public. 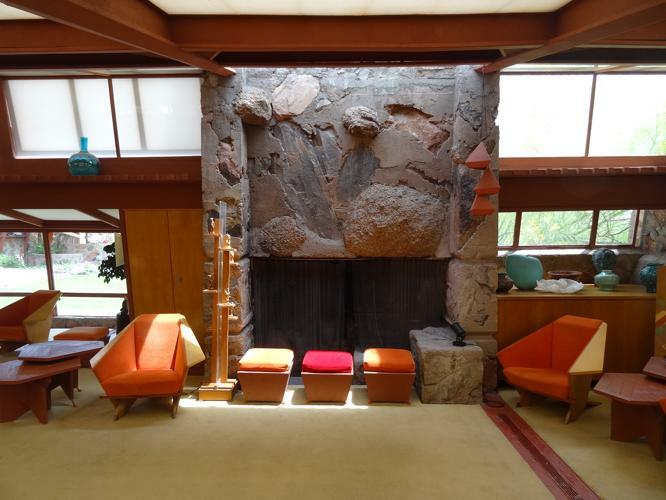 A special thank you to Bridget Steele, Director of Communications at the Frank Lloyd Wright Foundation.